Image from Blank Paper Will Always Be Ready. First of all, I use the word ‘Badjao’ loosely and only because everyone hereabouts refers to them as such. Out of respect to the Sama-Badjao tribes of south-western Mindanao, I don’t really know what indigenous tribes, if at all, these road mendicants of Lipa City belong to. 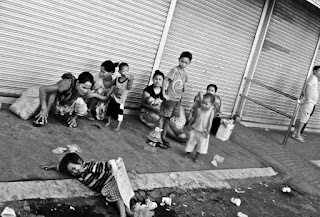 Last Saturday, because of the weekend traffic build up from outside of Fernando Air Base to the Star Toll gate, the road was infested with swarms of these filthy children with their tin can drums and white envelopes. They would cut across moving vehicles with chilling nonchalance, chase after and board moving jeepneys and distribute their envelopes to beg from passengers. Sometimes, one or two passengers would dig up a coin or two; but most would snort or cringe with disdain. With good reason, too; because for these kids, the word filthy is frequently an understatement. The driver of the jeepney I was in last Saturday was a cross old man who insisted that the children got off his vehicle immediately. They did so reluctantly after a moment’s staring down battle with the driver and probably with an invective or two spoken in their own language. After they disembarked, most of the passengers expressed annoyance at government because this obvious social problem is not being dealt with and also that it seems to be one that continues to grow. Indeed, time was when these indigenous people used to prowl the streets only during the holiday seasons. While Lipa’s rapid urbanisation in recent decades has been fuelled in part by immigration, regrettably the city’s growth has also brought problems such as these young road mendicants. First, there is the legal aspect of their presence on the roads. Obviously, prowling the roads as they do, they are a menace to motorists. I have also come across complaints from citizens in Internet boards about these children sniffing solvents in street corners, stealing and harassing or stoning passers-by. Law always ought to be uniformly enforced for all citizens. That one is an indigent or indigenous does not give one exemption from law. On the basis of any of the aforementioned issues, these children should have been rounded up long ago. Beyond the legality – or lack of it – of their presence on the roads of the city, it is the humanitarian aspect more than anything that dictates that they be taken off the streets immediately. Roads were built for motor vehicles; and if they pose a menace to these vehicles, these vehicles obviously pose greater menace to them. For example, one of these ‘Badjaos’ was side-swiped by a truck last year and had to be taken to a hospital by the driver according to an online article. Thus, the foremost reason why they need to be taken off the streets is for their own safety! Most of these street mendicants that I see are either early teens or pre-pubescent. They are filthy, underfed and sometimes in need of medical attention. For all the annoyance that they cause citizens, they are people; and the utter lack of dignity with which they live their lives is a matter for government intervention. Instead of being in school learning to be productive citizens, these children are on the streets being leeches and resorting to petty crimes. Obviously, when they grow older, they will become a proportionally bigger menace to society as well. I do not know what the solution is to this social problem; and I have heard stories that even if they were repatriated, they simply boarded boats and sailed right back. The problem is probably one for national government at the source; i.e. why do they leave their homes in the first place? Meanwhile, the problem is also very much here in this city as it probably is most everywhere else. I would like to think that local government is capable of finding a solution. As long as they are allowed to prowl the streets uncontested, they will continue to think that it is alright to do so. It is not, and it is high time government did something about the problem for the city’s sake as well as for the sake of the mendicant children themselves.